Nestled within over 1,000 acres and bounded by 5 kilometers of riverfront and primary rainforest, MidWorld takes all the adventure the area has to offer and places it in one setting. Located only twenty minutes from Quepos, our numerous tours operate within the park, letting you spend more time on the activities and less time getting to them. 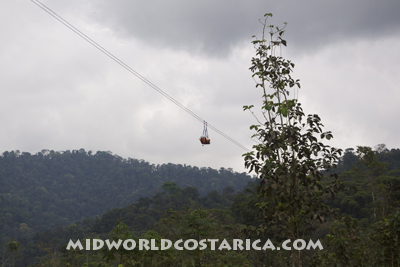 Various unique features of the park include Costa Rica’s longest Superman line, the area’s only high ropes puzzle course, and the area’s only fully-automatic ATV tour. All lines, both canopy and Superman, are double cabled and fit the latest international safety standards for canopy tours. In addition to operating the park, we strive to maintain Costa Rica’s natural resources through our reforestation efforts. By planting native hardwoods, we at MidWorld are working to ensure that Costa Rica continues to remain beautiful in the future. Race above the canopy on our 10 zipline, 15 platform tour. Compliant with the highest international standards of safety, we boast a dual-line system which ensures your security without compromising ride enjoyment. 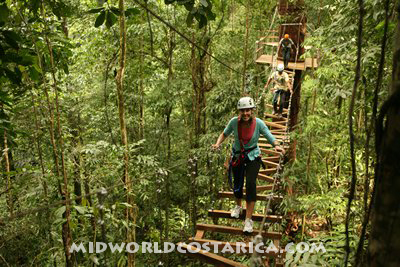 The tour also includes 2 rappel lines and a treetop suspension bridge. 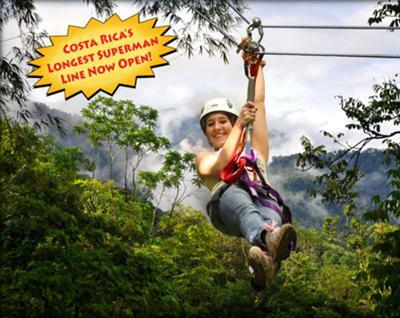 Sail through the air on the longest Superman line in Costa Rica. Start your journey on a forested mountain-top, and fly high above the Rio Cañas before concluding your journey back in the forest. This double-cabled ride measures over a kilometer. Get a monkey's-eye view on the area's only puzzle/adventure course. 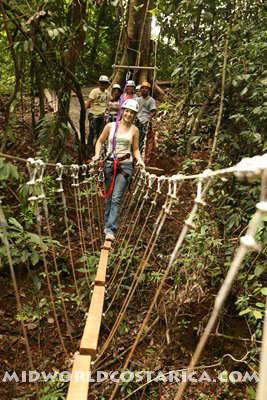 The tour includes numerous game bridges, a Tarzan swing, rappel line, and monkey climb. 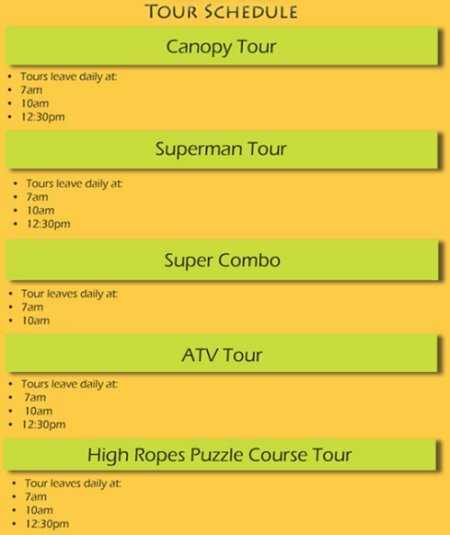 **The High Ropes Puzzle Course can be added to the Superman Tour for $40 extra.